This time I had to make some corrections and deny few of my statements?! Also, this will be my final word on this topic. are now linked and available for reading. collected records (published and unpublished articles), etc. According to the records, the early Moscow had ‘mosaic’ tail. (due to a Y-linked gene) seen on the (modern) Moscow guppies today? they think of solid blue & full colored guppy. This strain is originated in Moscow, Russia in the early 80’s ??? and then spreading around the world from there? in Milwaukee in 1998 shown by a Japanese breeder. they do not talk about Blue (Green, Purple nor Black) Moscow? with my statement about “Blue Moscow” guppies??? tropical fish websites, guppy clubs, forums, blogs, etc. do not call “Solid Blue” [Triangle/Delta] guppy – MOSCOW BLUE! has published pictures of guppies that are called the Blue Moscow! ‘Moscow veiled guppies‘ by Vasiliev N. Polkanov F.
guppy with a blue tail but not mentioned guppy with a blue head! Close to the false Muscovites are the Moscow blue selections of YA Levitsa. This is an excellent breed, which has the widest tails of blue color. THEIR POSITION AND COLORS, etc. SHEEN COLOR WICH COVERING ENTIRE BODY ??? I DON’T THINK SO (it’s absolutely unnecessary to clarify why)!!! N. Vasilev and F. Polkanov talk about the true and false Moscow. in artificial conditions using hormone injections. (the new gene / supergene) from which many new varieties were created. I will continue to represent them by that name in this article. BLUE, GREEN, PURPLE, BLACK MOSCOW ARE ESSENTIALLY THE SAME !!! because of the black component to the color. The black component can become so dark as to produce a Black Moscow. in the top layer of the skin. Purple Moscow is Blue Moscow with plentiful red color cells. That is why Moscow dramatically change color depending on the lighting. and another color from direct light from the front. They could look Blue, even Black, Green or Purple! If you are planning to put them on show bench, GOOD LUCK!!! NOTE: This strain is not fully mature until 10 months of age. “Some breeders have even developed the (modern) Red Moscow ???“. Red Moscow Guppy with a “red head” FULL RED MOSCOW ? when the species originated, who is the creator … ? have difference understending of these phenotypes. Russian Moscow Full Red have about 70-80% of Red color on the body and fins. Your opinion is 95-100% of Red color for Full Red strains. “The definition of Moscow cannot have redhead”. Red color is a pigment chromatophore color. they are not primary chromatophore color. Moscow Red is Red guppy with Gray Base body color and Moscow super-gene. Moscow supergene have a few different phenotype points (few genes). One of them – big spot on the front of the body (no red color). or (sometimes) Gray or over variants of Base body colors. was Russian famous guppybreeder Mr. Vyacheslav Kornev. and Golden guppy with big tail. with different Base body color genotypes and phenotypes. 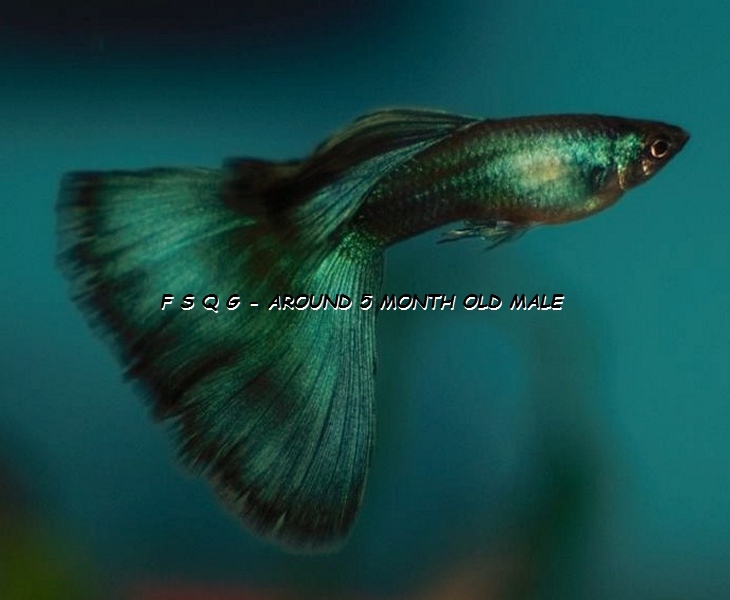 have been developed using ‘Triangle/Delta Three-Quarter Black’ guppies. crossing with “Triangle/Delta Green” guppies will bias the color to green. crossing with “Triangle/Delta Purple” guppies will bias the color to purple. of the front body including the head. although they are rarely co-regulated genetically. 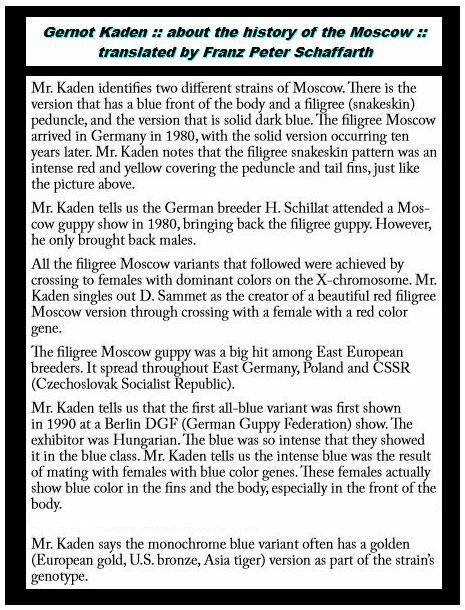 This entry was posted in Guppies - history of the species, Guppies anatomy & genetics, My Blog (by Igor D.) and tagged all about moscow guppies, all about moscow guppy, black moscow, blue moscow, green moscow, Guppies, Guppy, History of MOSCOW guppy, moscow guppies, moscow guppies for sale, moscow guppies live longer, moscow guppies supergene, moscow guppy, moscow guppy for sale, moscow guppy genetic, Moscow guppy genetics, moscow guppy super gene, MUSCOVITES, MUSCOVITES guppies, MUSCOVITES guppy, purple moscow, what are moscow guppies. Bookmark the permalink.